Hope everyone is having a great Sunday. It’s spa day for the animals around here. The girls needed brushing to get rid of the last of their winter coats. They do not like shaving so nature has to have her way which means they have a week or two of the scruff look. Today they were in the mood to really let me get some close ups. Mystic is always more camera willing than her sister, Noelle. She in the background getting the last bit of brushing. Did I forget to mention they also get bribed with carrots? 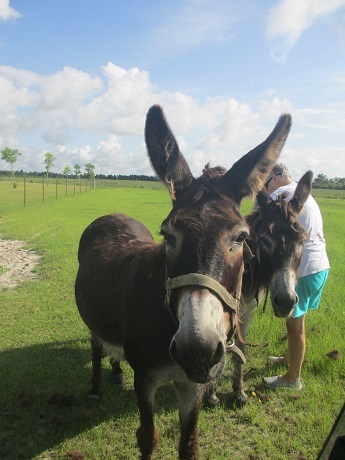 For those of you reading the Live Oak Series, I thought you might enjoy seeing the granddaughter of Jay the donkey. Jay’s real name was Jack and he was a rescue. Their grandmother was also a rescue.